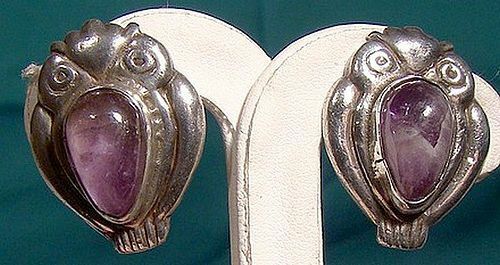 A 1930s pair of Mexican sterling silver & amethyst owl earrings. These screwback earrings are in the form of owls with natural amethyst cabochon cut stones. These 1" x 3/4" earrings are stamped MADE IN MEXICO and STERLING, and they weigh 12.0 grams. They are in excellent condition with no chips, cracks, dents, bends, corrosion, losses, damage or repairs. All items are thoroughly and conservatively graded and all condition issues are noted; all items are vintage or antique and may have slight signs of gentle use. Expedited tracked and insured parcel shipping to the U.S. starts at $18 (other spots may vary, air is higher). Items paid with a credit card will be shipped to confirmed addresses only. We do ship internationally. All of our prices are in $US. PLEASE NOTE: We DO NOT accept PayPal. A high quality Ming's of Hawaii vintage carved green jade and 14k gold pin. This 2-3/8" x 5/8" brooch features finely carved detail in the form of a stalk of bamboo, and it has a 14k yellow gold pin with safety catch and a planchet. The planchet is stamped MINGS 14K, and this pin is in excellent condition with no chips, cracks, dents, bends, corrosion, losses, damage or repairs other than some minor bends to the pin. All items are thoroughly and conservatively graded and all condition issues are noted; all items are vintage or antique and may have slight signs of gentle use. Expedited tracked shipping to the U.S. starts at $25 (other spots may vary, air is higher) - tracking and insurance are included in shipping quotes. Items paid with a credit card will be shipped to confirmed addresses only. We do ship internationally. All of our prices are in $US. PLEASE NOTE: We DO NOT accept PayPal, only VISA and MASTERCARD. A Sterling double link charm bracelet with 16 charms. 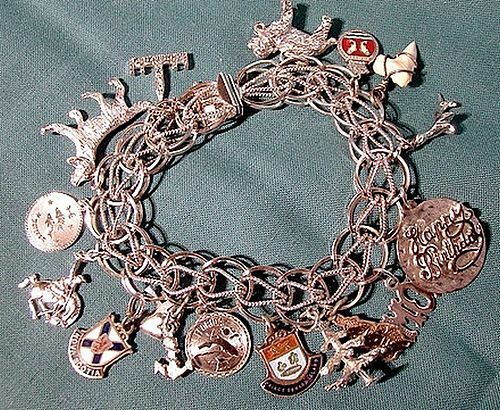 This 8" sterling silver bracelet has 16 charms with silver marks unless stated, and the charms include: Big Ben, setter dog, Pisces, bucking bronco, Nova Scotia coat of arms (enamelled), heart/anchor/cross, Florida, Prince Edward Island coat of arms (enamelled), Xmas tree, St. Lucia shape, Mom, Happy Birthday, seal, genuine shark's tooth (unmarked), Nipigon (enamelled, unmarked), St. Bernard (unmarked). It is stamped with a 3 stars maker's mark and STERLING, and this bracelet has a safety chain and box clasp, it weighs 48.8 grams, and it is in excellent condition with no chips, cracks, dents, bends, corrosion, losses, damage or repairs. All items are thoroughly and conservatively graded and all condition issues are noted; all items are vintage or antique and may have slight signs of gentle use. Tracked packet insured shipping to the U.S. starts at $17 (other spots may vary) - insurance and tracking is is included. Items paid with a credit card will be shipped to confirmed addresses only. We do ship internationally. All of our prices are in $US. PLEASE NOTE: We DO NOT accept PayPal, only VISA and MASTERCARD. A finely crafted vintage Edwardian 1-3/8 x 5/8" pin with a faux pink tourmaline crystal bezel-set stone. This pin is in 10k yellow gold, it has a safety catch, and it is stamped 10K. It weighs 2.2 grams, and it is in excellent condition with no chips, cracks, dents, bends, corrosion, losses, damage or repairs. Please not that the stone is an intense rose pink, not pale as it appears in our pictures. All items are thoroughly and conservatively graded and all condition issues are noted; all items are vintage or antique and may have slight signs of gentle use. Surface tracked shipping to the U.S. starts at $20 (other spots may vary, air is higher) - tracking and insurance are included in shipping quotes. Items paid with a credit card will be shipped to confirmed addresses only. We do ship internationally. All of our prices are in $US. PLEASE NOTE: we DO NOT accept PayPal, only VISA and MASTERCARD. 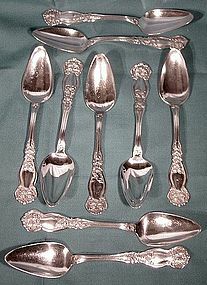 A grouping of nine 6" silverplated fruit or orange spoons in the Rogers International Orange Blossom pattern, introduced in 1910. 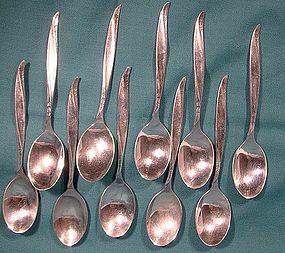 These spoons are in excellent condition with no monograms, dents, bends, corrosion, losses, damage or repairs. All items are thoroughly and conservatively graded and all condition issues are noted; all items are vintage or antique and may have slight signs of gentle use. Surface shipping to the U.S. starts at $8.50 (other spots may vary) - insurance is included. Items paid with a credit card will be shipped to confirmed addresses only. We do ship internationally. All of our prices are in $US. PLEASE NOTE: we DO NOT accept PayPal, only VISA and MASTERCARD. 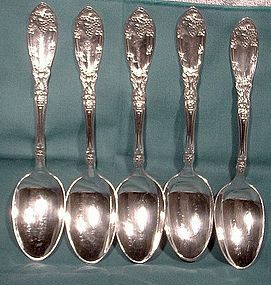 A group of five 6" silver plated teaspoons in the La Vigne pattern, introduced by 1881 Rogers in 1908. These spoons are in excellent condition with no dents, bends, corrosion, losses, damage or repairs. All items are thoroughly and conservatively graded and all condition issues are noted; all items are vintage or antique and may have slight signs of gentle use. Surface shipping to the U.S. starts at $6.90 (other spots may vary) - insurance is included. Items paid with a credit card will be shipped to confirmed addresses only. We do ship internationally. 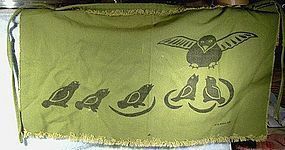 All of our prices are in $US. PLEASE NOTE: we DO NOT accept PayPal, only VISA and MASTERCARD. A vintage sterling silver necklace with a claw-set sterling shell cameo pendant c1930s. 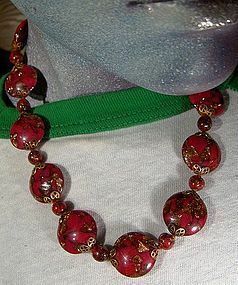 The chain is 19-3/8" long, and the cameo pendant measures just over 1-1/2" x 3/4" (including bale). The sterling silver chain with a spring-ring catch, which is stamped 925. The cameo setting looks hand made, but is not stamped (but it tests as high grade silver). The cameo pendant has an older rhodium finish, so the chain may have been changed at some point. 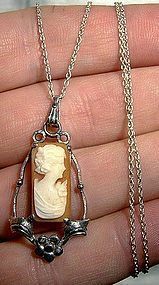 This cameo necklace is in excellent condition with no chips, cracks, dents, bends, corrosion, losses, damage or repairs. All items are thoroughly and conservatively graded and all condition issues are noted; all items are vintage or antique and may have slight signs of gentle use. Small packet air shipping to the U.S. starts at $8.95 (other spots may vary)- insured is higher. Items paid with a credit card will be shipped to confirmed addresses only. We do ship internationally. All of our prices are in $US. PLEASE NOTE: WE DO NOT accept PayPal, only VISA and MASTERCARD. 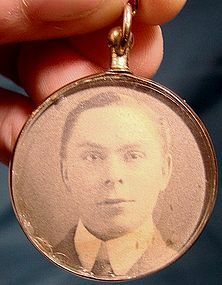 A 1-1/8" diameter 9k rose gold Edwardian hair and photo locket pendant fully hallmarked for Birmingham, England 1903-4. Meant to hold a photo on one side and a lock of hair on the other, this pendant features beveled glass and a threaded removable bale for photo and hair insertion. It has the maker's mark for William Vale & Sons (registered 1883), and it weighs 7.3 grams with the glass and instant relative. This item is in very good condition with no cracks, dents, bends, corrosion, losses, damage or repairs other than some chipping to the inner edges of the glass windows (the exposed edges are intact). All items are thoroughly and conservatively graded and all condition issues are noted; all items are vintage or antique and may have slight signs of gentle use. Expedited tracked shipping to the U.S. starts at $22 (other spots may vary, air is higher) - tracking and insurance are included in shipping quotes. Items paid with a credit card will be shipped to confirmed addresses only. We do ship internationally. All of our prices are in $US. PLEASE NOTE: we DO NOT accept PayPal, only VISA and MASTERCARD. A vintage c1920s silverplated 1-3/8 x 1" Egyptian style scarab pin. 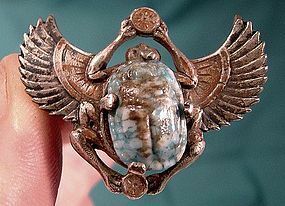 The glass scarab is claw-set and the pin retains some of the original black and brown painting. It has a c-clasp and it is unsigned; it is in excellent condition with no chips, cracks, dents, bends, corrosion, losses, damage or repairs other than the wear to some of the paint. All items are thoroughly and conservatively graded and all condition issues are noted; all items are vintage or antique and may have slight signs of gentle use. Surface shipping to the U.S. starts at $6.90 (other spots may vary) - insurance is included. Items paid with a credit card will be shipped to confirmed addresses only. We do ship internationally. All of our prices are in $US. PLEASE NOTE: we DO NOT accept PayPal, only VISA and MASTERCARD. 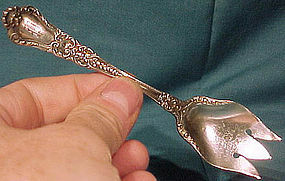 A sterling silver 4-3/4" ice cream fork in the Baronial pattern, introduced in 1898 by Gorham. This fork is the old issue with the Gorham hallmarks and the 1898 patent date. 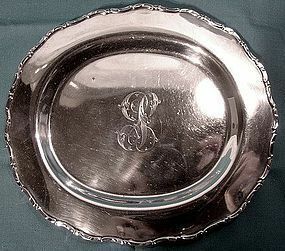 It has a P monogram, and it weighs 19.6 grams. 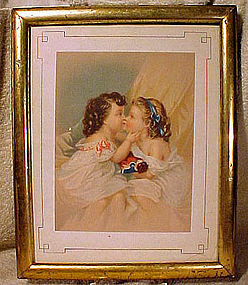 This item is in excellent vintage condition with no dents, bends, pattern wear, corrosion, losses, damage or repairs. All items are thoroughly and conservatively graded and all condition issues are noted; all items are vintage or antique and may have slight signs of gentle use/patina. Silver items are hand polished, not machine buffed. Small packet surface shipping to the U.S. starts at $6.95 (other spots may vary) - insurance is included to $99. Items paid with a credit card will be shipped to confirmed addresses only. We do ship internationally. All of our prices are in $US. PLEASE NOTE: we DO NOT accept PayPal, only VISA and MASTERCARD. A chariote sterling pin signed Aidan Toronto. This fine studio .925 sterling silver 2-5/8 x 1-1/2" pendant pin features a Charoite stone. 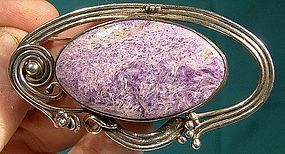 Charoite is a rare mineral found in Russia and introduced in 1978 (named for the Chara river). It has an unusual lavender purple swirl appearance and the silver mount accents this movement. This pin is signed AIDAN TORONTO HANDMADE SILVER 925, and it has a safety catch as well a loop for wear as a pendant and another loop for wear horizontally. It weighs 21.8 grams, and it is in excellent condition with no chips, cracks, dents, bends, corrosion, losses, damage or repairs. All items are thoroughly and conservatively graded and all condition issues are noted; all items are vintage or antique and may have slight signs of gentle use. Expedited tracked and insured parcel shipping to the U.S. starts at $19 (other spots may vary, air is higher). Items paid with a credit card will be shipped to confirmed addresses only. We do ship internationally. All of our prices are in $US. PLEASE NOTE: We DO NOT accept PayPal.